This glossary covers some of the common definitions, acronyms, and slang in daily fantasy sports. 50/50 – A type of contest where the top 50% scores of entrants double their entry fee (less the rake), and the bottom half lose their entry fee. This is perhaps the safest type of DFS contest. Similar to double ups. Action – The amount of money or contests in play. Bearish – An unfavorable view on any player, team, game, or situation. It is the opposite of bullish. Bullish – A favorable view on any player, team, game, or situation. It is the opposite of bearish. Buy-In – The amount of money required to enter a contest. Same as entry fee or stake. Cash Game – A term that refers to contests where the prize pool is generally awarded to 50% of the entrants. These type of contests include head-to-head, 50/50s, and double-ups. Ceiling – The maximum scoring projection expected for a player. Combo – Drafting a QB and at least one other player from the same team (RB, WR, TE) in the same game. Strategy used in high scoring potential games for all players used. Same as stacking. Contrarian – An attempt to select an unpopular or lightly used player(s). This may be a common strategy in large GPP tournaments. CV – Coefficient of Variation. CV = Standard deviation/mean. Standard deviation measures the amount of variation from the average. Mean is also referred to as expected value. This formula is used to gauge a player’s consistency. The lower the CV is, the more consistent a player is. Dart Throw – A wild guess in choosing a player with an unpredictable outcome. Diversify – Having multiple lineups that vary greatly from each other. They usually cover a broad range of different players to minimize risk. Same as hedging. Dollar Per Point ($/Point) – The dollar amount of a player’s salary needed to generate a point. The lower this amount is the better. Double Up – A type of contest where most of the top half of entrants double their buy-in, and the rest lose their buy-in. This is one the safest type of DFS contest. Similar to 50/50s. DVOA – Defense adjusted value over average. Comparing a team’s statistical averages to the baseline NFL averages. Entry Fee – The amount of money required to enter a paid contest. Same as buy-in or stake. Exposure – The amount of salary spent on a particular player. The higher the exposure means the higher his cost. Fade – To avoid or dislike a particular player, team, game, or scenario. Fish – Inexperienced and/or bad players that make easy prey. FFFC – FanDuel Fantasy Football Championship. At the time of this writing, it is the largest dollar tournament in the DFS industry. Field Size – The number of players or entrants in a particular contest. Flex – A roster position spot that may be filled by a RB, WR, or TE. Floor – The minimum amount you expect from a particular player. High floor players are ideal for cash games. 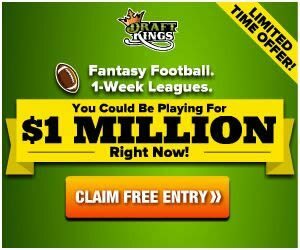 Freeroll – A free contest that has no entry fee but rewards the winning player(s) with some type of cash or site point awards. Full PPR – 1 point scored per reception. GPP – Guaranteed Prize Pool. The total guaranteed cash payout for a contest. These contests have specified guaranteed payouts, regardless if the maximum entry size of the contest is filled or not. Grinder – A high volume DFS player mostly invested in safer cash games. Half PPR – .5 points scored per reception. Head-to-Head (H2H) – A type of contest where it is just 2 competitors against each other. The winner takes all (minus the rake) and the loser loses their buy-in. Hedge – Using a variety multiple lineups that vary greatly from each other to reduce risk. Same as diversifying. High/Low – A lineup composed of expensive but productive players and cheap dart throw players. High Stakes – Contests with higher end entry fee requirements. Late Swap – A lineup editing feature which allows you to change your player if his game time hasn’t started yet, as opposed to lineups that are locked from editing when the first players game have started. DraftKings has this feature available. Lean – Liking or favoring a particular player, team, game, or scenario. Lineup Lock – When lineups can no longer be edited. Usually after the first player’s game time has started. Luck Box – Someone who just got lucky. Minimum Salary – The lowest possible salary for a player at any given position. Multiple Entry – Contests that allows you to enter more than one lineup in the same contest. Multiplier – A contest type that pays to the winner the predetermined multiplier amount. For example a 4X multiplier will pay the winners 4X their entry fee. Overlap – The percentage of which a particular player is used in a contest. If a player has an overlap percentage of 50%, he was used by half of the teams in the contest. Overlay – This occurs when a GPP tournament pays out more than the total amount of entry fees collected for this contest. In this case, the DFS site loses money on this contest. Over/Under (Total) – The oddsmaker’s number of what the combined score of both teams in the same game should be. Paying Up – Spending on an expensive or most the expensive player by position. Player Pool – The players that are available to be drafted into a lineup. Prize Pool – The total cash payout amount for a particular contest. Punt – A very cheap bottom-barrel type position play with a low floor or unpredictable positive outcome. Usually used as a salary plug play just to fit in other higher priority roster spots. Qualifier – A GPP contest in which the winner(s) are paid with entry tickets to a bigger, upcoming contest. Same as satellite. Rake – The percentage of a player’s entry fee that is kept by the DFS site for every paid contest. This percentage is usually 10% or less. Reach – A player that has little chance of decent production. Salary Cap – The total amount of dollars available to spend on players towards building a lineup. Satellite – A contest type that awards the winner(s) an entry ticket to a larger, upcoming contest. Same as qualifier. Season Long – Fantasy leagues that start in week 1 of the season and does not crown a champion until the end of the season. The timing of the end of the season will vary. Shark – An experienced, professional, or very successful DFS player. Single Entry – Only allows one lineup per contest. Sleeper – A cheaper player that may have sneaky potential production, for whatever reason. Snake Draft – A Drafting style that has players pick in order, and when the round is complete, the players pick in reverse order, and this pattern continues for each round until the rounds are completed. It’s how you draft in a basic season long fantasy league. Spread – This is the amount that oddsmakers deem one team is favored over another team. For example, Cowboys -7 vs. Lions. This means the Cowboys are favored to win by 7 points. Stack – Playing a QB and at least one of his skill position teammates (RB, WR, TE). A common strategy used in all contest formats. Advantageous when all players in the stack have favorable matchups. Same as combo. Stake – The amount of money invested in a contest(s). Same as buy-in or entry fee. Steps – This is a type of contest where the winner(s) receive an entry ticket into the next more expensive round of contests or next “step”. It is similar to qualifier tournaments, except if you don’t win at the early step stage, you can buy-in for a higher entry fee into the next step contest. Studs and Scrubs – A combination of expensive, productive players and cheaper, lower floor players. Same as High/Low. Survivor – This is a type of contest which begins in week 1, and continues each week until there is one player still alive. Each week, based on scoring format, entrants in this contest will be eliminated for good. The remaining survivors continue on to the next week and so on until we have a sole champion. There can only be one! Ticket – A ticket can be earned or won and is used to enter a contest in lieu of cash. Tickets cannot be redeemed for cash. Tier – This is a grouping of similarly ranked players by position. For example, Tier 1 QBs could be Andrew Luck, Aaron Rodgers, Drew Brees, etc. Tier 2 QBs could be Russell Wilson, Tony Romo, Matt Stafford, etc. Tournament – The basic, most common multi-player type of contest in DFS. They can greatly vary in size, format, prize pools, etc. Train – Or running a train. This refers to using the exact same lineup, multiple times in the same contest. This is a very high risk/high reward type of strategy but if this lineup hits, you may cash out X however many entries were made. Triple Up – A type of contest where the top third winner(s) triple their entry fees (less the rake). Everyone else loses. Value Play – This is a cheaper priced player that hits or exceeds his acceptable projected point total. Basically, all winning GPP lineups will have to hit with these types of players.